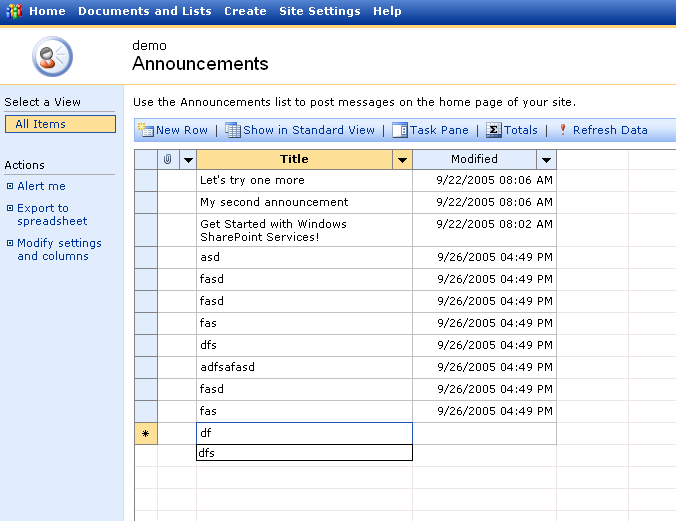 In my last post, I mentioned the neato ‘Datasheet’ view that comes with SharePoint. I'm sure this is old hat to many of you out there, but on the off chance you haven't played with it, the Datasheet is definitely worth checking out. In a nutshell, the Datasheet is a special view that lets you do bulk editing of SharePoint list content. It's a great tool to have in your arsenal when you are building apps on SharePoint. You can get to the Datasheet by clicking the 'Edit in Datasheet' button that's on the detail view for most lists - you can also create a new Datasheet view via the list's view creation UI. When you click the 'edit in Datasheet' button, you get a page that looks like this. Using the Datasheet grid control in the center, you can quickly add, edit or delete content. I use this view all the time when I need to quickly get a lot of data into one of the lists I'm building an application around.